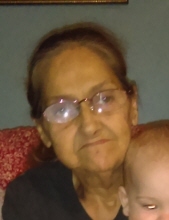 NINA LOUISE GRIZZLE, 56 years of age of Big Rock, VA, passed away Monday, March 25, 2019 at the Tazewell Community Hospital following an extended illness. Born in Grundy, VA, she was the daughter of the late Dale Hayes and Nina Mae Smith. She was a lifelong resident of Buchanan County and was of the Christian faith. She was a loving mother, grandmother and was a wonderful homemaker. In addition to her parents, she was preceded in death by her longtime companion Michael Grizzle. Those left to cherish her memory include 2-Sons: Mitchell (Ruby) Grizzle of Cedar Bluff, VA, Jesse Grizzle of Big Rock, VA; 3-Grandchildren: Onna Grizzle, Delphia and Michael Ramsey; 4-Brothers: Randall Smith of Oakwood, VA, Danny Smith of Big Rock, VA, Roger (Tiffani) Smith of Grundy, VA, Robert (Beth) Smith of Grundy, VA; 1-Sister: Teresa Smith of Big Rock, VA.
Funeral Services for NINA LOUISE GRIZZLE will be conducted Wednesday, March 27, 2019 at 7:00 P.M. at the Grundy Funeral Home Chapel with Willard Grizzle and Freddie Rife officiating with cremation to follow. Visitation will be held from 6:00-7:00 P.M.
Grundy Funeral Home of Grundy, VA is honored to serve the family of NINA LOUISE GRIZZLE. To plant a tree in memory of Nina Louise Grizzle, please visit our Tribute Store. "Email Address" would like to share the life celebration of Nina Louise Grizzle. Click on the "link" to go to share a favorite memory or leave a condolence message for the family.